I got these new Prismacolor pencils and could not put them down! As I have written before I love keeping a bullet journal and have been doing that for several years. It is a way to wedge extra creativity into your life and it makes life look fun and not onerous. Even dentist appointments! A good-looking BuJo, the hipster abbreviation for Bullet Journal, can help you get your life together in other ways too. 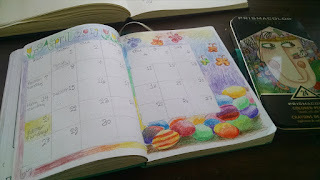 I use mine to track projects and ideas and things and the colors make you happy as opposed to stressed out. Enough excuses, I just could not put these pencils down, is the long and short of it. And so I jumped the gun on April and Easter. The butterflies on the tin got me thinking. I sort of borrowed them and then went from there. I wish I could just keep going! I wish I could color this website with these Prismacolors. But first things first. Is there anything more fun to color than Easter eggs? No. That should be next year's theme!